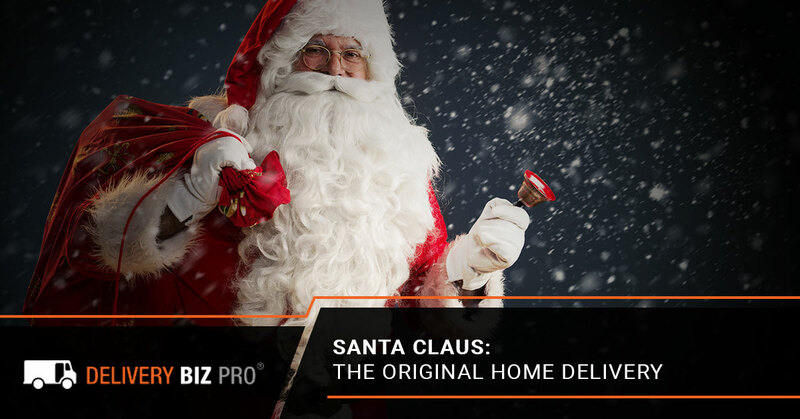 Home Delivery Software: Does Santa Claus Need A Delivery Software? Happy holidays! Here at Delivery Biz Pro (DBP), we’ve been busy providing technical support for our route management software users while spending as much time with our families as we can before the holiday season gets into full swing. On the DBP blog, we spend a lot of time discussing the logistics of our home delivery software and how it can help optimize your recurring delivery business. Today, we’re going to shift gears a little bit and discuss the one person who is perhaps the gold standard in home delivery: Santa Claus. During this time of year, adults and children alike are reminded of the burning question: How the heck does Santa make a delivery to every Christmas-celebrating household in the entire world in one night? Keep reading to find out, and learn how a good home delivery software can make you almost as efficient at Kris Kringle himself. Whether you know him by Saint Nicholas, Kris Kringle, Father Christmas, or good ol’ Santa Claus, the man with the beard is regaled throughout the world as a one-night-only gift-bringer to children. But how did we get the Santa we know and love today? Santa Claus as we know him evolved from the historical Saint Nicholas, a fourth-century Greek bishop who was known for his kindness and generosity. His legacy has lasted for centuries. Saint Nicholas soon became known as the patron saint of various groups including sailors and children, as well as the patron saint of entire cities, including Amsterdam and Moscow. By the Middle Ages, children were given gifts in honor of Saint Nicholas on the day of his death, December 6. However, as religious tensions evolved in Europe, there was an opposition to the worship of saints. In order to keep the tradition of providing gifts to children going, Saint Nicholas became ‘Santa Claus’ and the gift-giving day was moved to Christmas Eve and Christmas Day. Since then, Santa Claus has evolved from a saint to a jolly, white-bearded man who delivers presents to every child in the world on Christmas Eve. So, just how many deliveries is Santa expected to make in one day? One source estimates that there are about 526 million Christian children worldwide who might be waiting for St. Nick to deliver a new toy on Christmas Eve. The actual number of people who celebrate gift-giving on Christmas could be much higher. But essentially, that breaks down to over 6,000 kiddos per second that Santa needs to visit. Maybe Santa should get into the delivery software industry and share some of his tips! Could A Home Delivery Software Help Santa Claus? A good home delivery software can do a lot. Can it figure out how to help one driver make 6,000 deliveries per second for a 24-hour period? Probably not. But that doesn’t mean people haven’t tried to guess how the big man does it. You can always rely on NORAD to tell you where Santa will be on Christmas Eve. Santa’s schedule is a lot different than the industries that we help with our home delivery software. While Santa makes deliveries one night a year over the entire world, the industries that DBP serves focus on recurring deliveries. Businesses like small dairy farms or water jug delivery businesses who make deliveries to their customers weekly or biweekly, for example, can benefit from our delivery software. Santa is pretty darn good at making deliveries on Christmas Eve. But, what happens if you run a home delivery business but you don’t have the luxury of magical reindeer and the ability to move at superhuman speed to help you make your delivery rounds? You call Delivery Biz Pro! We know that the holidays are a hectic time for any delivery service, from Santa to Amazon to your small recurring delivery business. Make sure that you are using one of the best home delivery software options on the market to manage everything from orders and payments to loading the trucks and making deliveries. Our software helps to optimize your business to take the guesswork and hassle out of delivery routing. Get in touch to learn more about using our delivery management software, and from our family to yours, enjoy the upcoming holidays!